The 998 acre Pigtail Hollow State Forest is located eight miles north of the village of Bath. The forest is located in the towns of Wheeler and Urbana in Steuben County. It shares a common boundary with Urbana State Forest. Recreational opportunities on this state forest focus on a rustic experience with a limited amount of development. The Bristol Hills Trail provides good access to the interior of the forest. 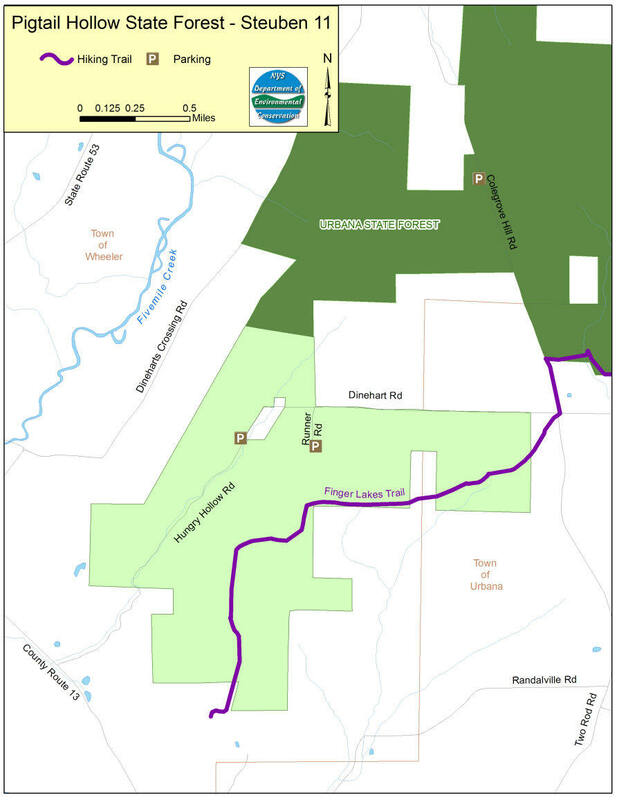 This trail is a branch of the 900+ mile Finger Lakes Trail System. A rustic campsite called "Granma's Campsite" is located just off the Bristol Hill Trail in the forest. To gain access to this state forest from Bath, proceed north on County Route 13, Mitchellsville Road. Turn right (also northerly) onto Hungry Hollow Road, which bisects the forest.